Snapppt provides the means for you to take your curated feed with you, onto any page of your website or store. To do so, sign into your Snapppt account, then visit the Shoppable Galleries. 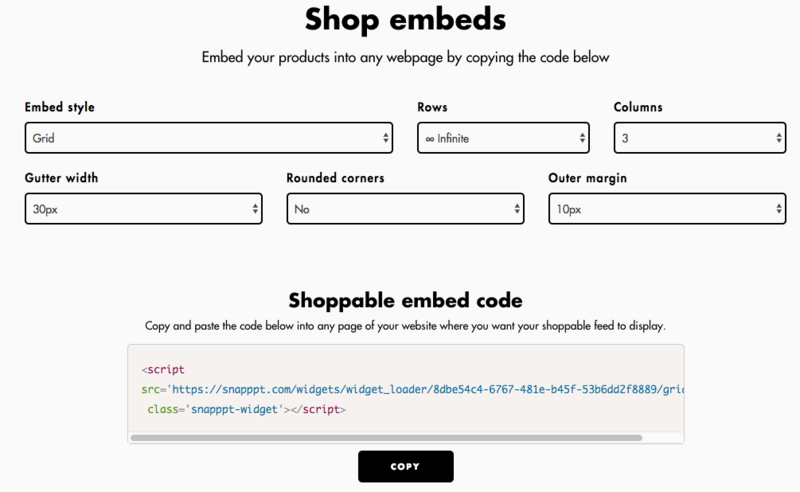 Grab your shoppable embed code, and paste this into the page or theme of your store, wherever you'd like it to appear. Using Shopify? You can easily install your Snapppt feed onto any page using our auto-install tool. See the Shopify section of the help center for information on embeds, including how to add your feed to your homepage.